I appreciated Karpman’s advice to begin each project by getting thoroughly acquainted with our orchestral libraries and arranging our instrument choices meticulously. That’s a working method that I’ve also followed throughout my career. Exploring the depth and breadth of our sound libraries at the beginning of a project is crucial towards understanding where we might have gaps in our libraries that need to be filled. I discuss the process of acquiring new virtual instruments during a project in my book, A Composer’s Guide to Game Music (pg. 131). I also discuss the many ways that we can maximize the realism of our virtual instruments (starting on page 224). Karpman covered some of the same ground during her presentation. At one point she reminds us that virtual instruments must behave the way real instruments would. “People breathe,” Karpman points out. “If you are writing a flute line that is continuous and there’s no room for breath, it’s not going to sound real.” While acknowledging that it’s important for us to stay on top of technological developments in virtual instrument software, Karpman encourages us to also stay in touch with the realities of acoustic musicianship and the real-world capabilities of each orchestral section. 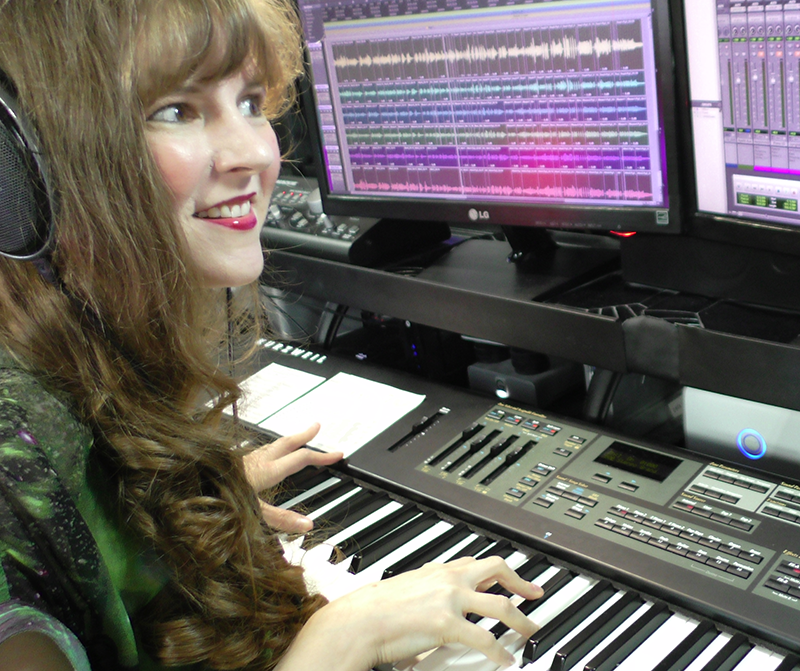 As a long-time Pro Tools user, I completely agree with Laura Karpman about the versatility of the software. Pro Tools is tremendously convenient for a composer who likes to combine MIDI and audio work frequently in the same session. It’s also very easy to share Pro Tools session data with our colleagues, since Pro Tools is such a popular and ubiquitous software application in the game audio community. On a more personal note, I’ve had several opportunities to record with live musicians, and I thought it might be useful at this point for me to include some of my own live orchestral music (along with the MIDI mock-ups) for the sake of providing a concrete example. With that in mind, I’d like to share some personal observations about recording with an orchestra for tracks I composed for the Ultimate Trailers album (pictured left), released by the West One Music label. I’ll be using as an example my Ultimate Trailers track, “Valour,” which was performed by the AUKSO Alvernia orchestra. First, a little background info: the AUKSO Alvernia orchestra (pictured below) has been named as one of Europe’s foremost ensembles, and is led by eminent violinist and conductor Marek Moś. The Ultimate Trailers album was designed to be a collection of hard-hitting, epic orchestral tracks for use in television and film. Since its release, the music I composed for Ultimate Trailers has been featured in popular sports programming such as NBC football, FOX Major League Baseball and the PGA Championship. When I first composed the “Valour” orchestral track, I worked in my studio (pictured below) primarily with MIDI libraries (including instruments from such libraries as East West Symphonic Orchestra, Vienna, Hollywood Brass, LA Scoring Strings, etc). Creating an effective MIDI mock-up depends greatly on our understanding of the mechanics and artistry of the actual orchestra. Laura Karpman’s GDC talk is an interesting exploration of an important topic for any video game composer. For those of us with access to the GDC Vault, the entire video of Karpman’s session is available here. Garry Taylor (pictured left) is an Audio Director in Sony Computer Entertainment Europe’s Creative Services Group – a division of the company that designed and manufactures the PlayStation console. In that capacity, Taylor gave a presentation at GDC 2016 that extolled the virtues and benefits of the proprietary PlayStation 4 Audio Mastering Suite. The PS4 Mastering Suite is built into the game console, and its capabilities are available to all developers for the PlayStation system by virtue of an accompanying software package. Named “Sulpha,” (pictured below) this signal processing application includes a four band parametric EQ, a three band compressor, a simple gain stage, and a peak limiter. All of these tools are meant to accomplish a simple yet very important task – to enable developers to adhere to a consistent loudness standard across all titles developed for the PlayStation console. While all of these details about Sulpha (pictured above) were fascinating, and were explained in detail during Taylor’s GDC talk, I found myself particularly interested in Taylor’s ideas about the nature of audio mastering itself. He expressed many firm opinions about the most desirable goals of the mixing and mastering process. He also described methodologies for achieving the best end results. Since many video game music composers are also responsible for the mixing and mastering of their own recordings, I thought that an exploration of Taylor’s ideas on this topic could be very helpful to us. As a side note, I’d like to mention an interesting concern that is suggested by Taylor’s discussion of mixing and mastering tools that are built into a game’s audio engine. Usually, when delivering linear music for use in any entertainment project, we can be confident in our mix and master because we have recorded and delivered it in its final, stereo format. But when introducing musical interactivity into the process, things become much more complicated. As games more frequently employ interactive music constructs such as Vertical Layering, we may find ourselves becoming more interested in how the overall signal processing capabilities of the game’s audio engine are impacting the final mix of our interactive music recordings. Achieving a stellar final mix is challenging in the best of circumstances. Working together with audio directors and sound designers, we game composers will have to be especially vigilant, knowing that the mix of our interactive music isn’t truly “final” until the game is being played. Garry Taylor’s talk at GDC 2016 is very detailed and includes a live demonstration of the Sulpha software application – those with access to the GDC Vault can watch the entire video here. I hope this blog was able to convey some useful music and audio production tips from two GDC 2016 sessions. Thanks for reading, and please feel free to share your thoughts in the comments section below! This entry was posted in Conferences, Game Music, Middleware, Software, Virtual Instruments and tagged dynamic range, East West Symphonic Orchestra, game developers conference, Garry Taylor, GDC, Hollywood Brass, LA Scoring Strings, Laura Karpman, Mastering, MIDI, Playstation, PlayStation 4 Audio Mastering Suite, Pro Tools, Sony Computer Entertainment Europe, Sulpha, Ultimate Trailers, video game composer, Vienna Symphonic Library, virtual orchestra, West One Music. Bookmark the permalink.